An informal paragliding and hang gliding get-together has been taking place at Pine Mountain almost every year for the last 28 years, bringing smiles to the faces of pilots and their families since 1991. Pilots from near and far gather to enjoy morning, mid-day, and glass-off flights, and the evening gatherings that ensue. The 28th annual Pine Mt. 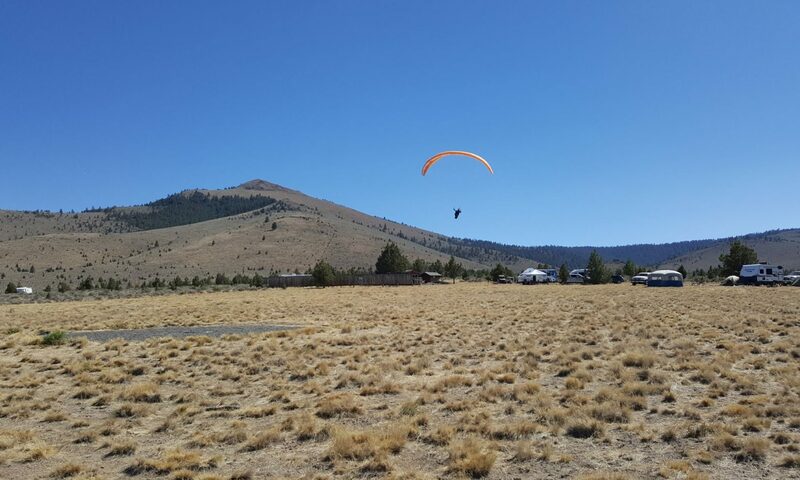 Fly-in was held August 31 – September 3, 2018 near Bend, Oregon. See the 2018 Photo Album for photos taken during the last Pine Mt. Fly-in. Camping options are abundant in the area with most attendees planting their tents and RVs at Frankie’s Flying Farm. Note this is an informal gathering and therefore admission is free. But be aware that several of the sites people will be flying are privately-owned, and USHPA membership is required to fly there. 1. Pilots using the privately-owned launch (Training Hill) and LZs (Rock L and Flying Farm) must be current USHPA members. 2. Training hill launch area: If the launch area is busy please do your preflight and clip-in out of the way, then move into the active launch area when you’re ready to take off. 3. Rock L: Please carpool because parking is limited. Park in the area between the orange cones and the rock wall; don’t park north of the orange cones. Land in the grassy area north of the orange cones, and fold your glider in the pea gravel south of the parking area. 4. Flying Farm: Land near the circle south of the main cabin, and fold your glider in the pea gravel adjacent to the main cabin. 5. West launch: Please carpool because parking is limited. We recommend cars traveling to the west launch carry a shovel and water in case of fire.